A blog about crafting, cooking, living, and believing. Yall, I am not really sure where summer went this year, but FALL is in the air! Do you feel it? In the South the kids are heading back to school, the mornings are cooling off (a little), college football is just around the corner, and pumpkin flavors are beginning to be found in delicious recipes and on the shelves of Walmart. And if you have been around A Step in the Journey you know that pumpkin is one of my favorite flavors. I may even have a tendncy to go a little pumpkin crazy this time of year. Today I have another great pumpkin treat to add to the list. 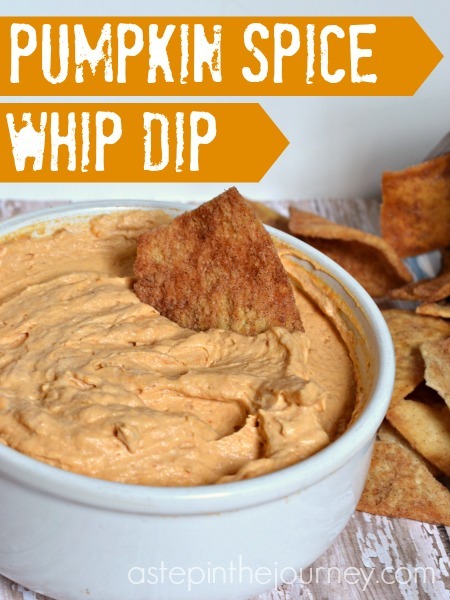 This Pumpkin Spice Dip is quick and easy to whip up and add to your kid’s lunchboxes or serve as an after school snack after a busy day of school. 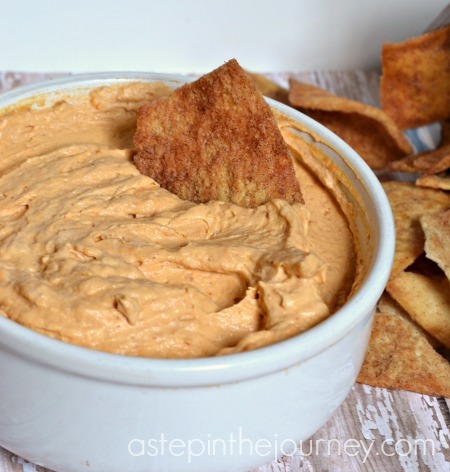 I also love to make this dip to take to tailgates on college football Saturdays. Since the ingredient list for this recipe includes Cool Whip, it is nice and fluffy, making sure to leave room for all the other lunchbox or tailgating goodies! However, if your friends and family are like me they might just fill up on this dip. You can find all ingredients at Walmart. The Cool Whip will be in the freezer section on the dessert aisle, and the pumpkin puree and Jello pudding mix on the baking aisle. Make sure and take along your $1.00 off coupon (while they last) for when you buy one tub of Cool Whip and two JELL-O pudding mixes. Whisk yogurt, pumpkin puree, and JELLO pudding mix until combined. Fold in the Cool Whip and refrigerate for at least an hour. 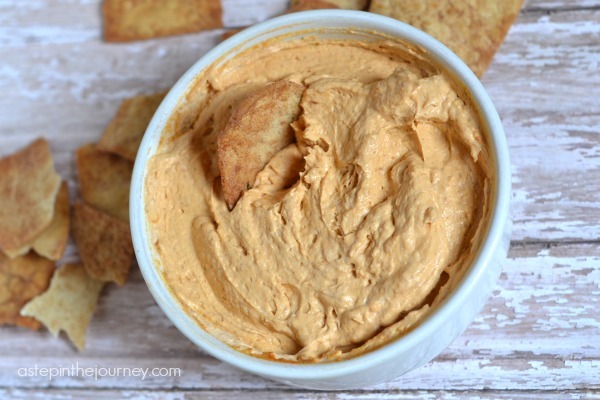 Serve with Cinnamon Sugar pita chips, pretzels, graham crackers, or apples. As I mentioned you can serve it with pretzels, graham crackers, or apples, but my favorite item to dip are cinnamon sugar pita chips! Absolutely delicious. So what is your favorite FALL snack? Does it include pumpkin, like pretty much ALL of mine? Check out a few other pumpkin recipes: Pumpkin Spice Donut Holes, Two Ingredient Pumpkin Cookies, and Pumpkin Cake Pops! Want more easy recipes, fun activities for your children, and simple DIY tips? Sign up below to receive A Step in the Journey right in your inbox! Oh my gosh, that sounds divine! Definitely going to try it now that the weather seems to be cooling down; I can’t wait for fall! Wow. This sounds so yummy! I’m ready for fall… even though we’ve had such a mild summer. It’s been so nice! The pumpkin spice jello pudding is one of my favorites! Love this recipe… looks so good!!! Pinning now! Rachel Rockwell recently posted…How to Blog on a Trip with Free Data! This is perfect for Fall parties!! Or breakfast ;) I love anything and everything pumpkin and Cool Whip is a staple in my freezer. This looks SO easy! Yum! I love this!!! Wait did she just say they don’t sell Pumpkin Jello in Canada … thats so sad! Oh MY!!! I’m definitely going to have to pick up some of that pumpkin jello pudding when I’m across the border next month. I think it’s the only ingredient out of these that we don’t have in Canada and now I have a serious craving! Courtenay @ The Creek Line House recently posted…Easy Molding and Trim Work Trick: Figuring out what to do about tricky angles.